(CNN) -- England striker Wayne Rooney has escaped further punishment after a show of petulance following his sending off during Manchester United's weekend defeat at Fulham. Wayne Rooney confronts referee Phil Dowd following his dismissal during the defeat at Fulham. But Rooney will receive a formal written warning from the Football Association after punching the corner flag when ordered from the pitch. Rooney was dismissed for two bookable offences during his side's 2-0 defeat -- the second caution coming after he hurled the ball in the direction of where referee Phil Dowd wanted a free kick taken. 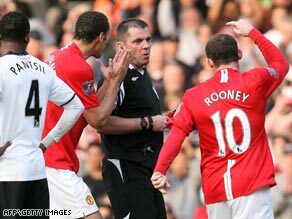 Although Rooney exchanged words with Dowd after being shown red, the official has confirmed he was not sworn at by the player. An FA spokesman said: "We have clarified with Phil Dowd that there was no abuse from the player after he was dismissed. "In relation to the incident when he punched the corner flag, the referee did not see that and we have written to Wayne Rooney reminding him of his responsibilities." It means Rooney will only be suspended for one game, the Premier League visit of Aston Villa to Old Trafford on April 5.